(TORONTO) – Boosting RAV4’s notable fuel efficiency with a $24,295 MSRP, Toyota tells Canadian drivers looking for maximum adventure and minimal fuel costs that the Toyota RAV4 is their perfect partner. And they’ve known it for more than a decade now; ever since Toyota created a whole new type of vehicle – the compact SUV – when it introduced the RAV4 in 1996. Now, as the 2009 RAV4 models roll into Toyota Dealers across Canada, new urban-savvy two-wheel-drive editions join the ever-popular RAV4 models featuring four-wheel-drive. Five two-wheel drive models will join the six four-wheel-drive options currently available to Canadian drivers. Regardless of drive train, the 2009 Toyota RAV4 features the same great choice of energetic yet fuel-efficient 4-cylinder or powerful V6 engines, plus a generous suite of standard safety and convenience features, making the RAV4 the perfect vehicle for Canadian drivers seeking more choice, more value and more fun. Whether it’s two-wheel-drive or four-wheel-drive, the 2009 Toyota RAV4 is available with a new, more efficient 2.5-litre 4-cylinder engine that produces up to 179 hp (13 more than the 2008 model), even as it achieves improved fuel efficiency. The new engine is mated to a 4-speed automatic transmission. Meanwhile, those looking for maximum power will enjoy the proven and muscular 3.5-litre V6, which is paired with a 5-speed automatic to produce up to 269 horsepower. A generous suite of handling and control technologies let drivers push the 2009 Toyota RAV4 to its limits, while each vehicle comes stacked tall with standard features, including: MP3 capability; power door locks, windows and heated mirrors; cruise control; Optitron gauges; a new fuel economy meter; keyless entry; air conditioning; plenty of smart storage spaces; six airbags; dual vanity mirrors; and more. The 2009 Toyota RAV4 is now on sale across Canada. Visit toyota.ca to locate a Toyota dealer. The RAV4 2WD carries a manufacturer’s suggested retail price starting at $24,295, with the RAV4 Sport 2WD starting at $28,435 and the RAV4 Limited 2WD starting at $29,905. Suggested starting prices for V6-powered 2WD models are as follows: $30,190 for the RAV4 V6 Sport 2WD and $32,160 for the RAV4 V6 Limited 2WD. The RAV4 4WD carries a manufacturer’s suggested retail price starting at $26,980 with the RAV4 Sport 4WD starting at $30,660 and RAV4 Limited 4WD starting at $32,130. Suggested starting prices for V6-equipped models are as follows: RAV4 V6 4WD at $29,595; RAV4 Sport V6 4WD at $32,415; RAV4 Limited V6 4WD at $34,385. Canadian drivers ready for adventure are ready for the Toyota RAV4 – the compact yet versatile SUV with a choice of two engines. Choose RAV4’s energetic yet efficient 2.5 litre four-cylinder engine – new for the 2009 model year, replacing the 2.4 litre engine offered in the past – mated to a four-speed automatic transmission and enjoy driving a remarkably fuel-friendly vehicle that spends more time on the road and less time at the pumps. Or, for maximum adventure potential, opt for the powerful 3.5 litre V6 and five-speed automatic transmission, which delivers plenty of torque and towing capacity for those times when getting away from it all means taking big stuff with you. Either way, confident acceleration, driving comfort and ample power are the watchwords of the day, meaning the RAV4 is always ready to explore the open road. Moreover, drivers will appreciate the ability to take control of maximizing their fuel efficiency with a new fuel economy meter, the latest edition to the RAV4’s advanced technology instrument cluster. Pick your favourite: The fuel-efficiency of front-wheel-drive with automatic limited slip differential, or the confidence of four-wheel-drive featuring Toyota’s Active Torque Control System. Either way, your new 2009 Toyota RAV4 rides on a suspension system designed with driveability, comfort and durability in mind. All 2009 RAV4s employ front suspensions featuring MacPherson struts, coil springs, and a stabilizer bar to minimize roll for excellent steering response. At the rear, a double wishbone suspension features coil springs, a stabilizer bar and trailing arms for secure handling. On the RAV4 Sport 4WD and RAV4 Sport V6 4WD models, both suspensions are sport tuned for a stiffer, more direct ride feel. The RAV4’s electric power steering is not only highly responsive at every speed, it also lighter than a traditional power steering system and requires no steering fluid, making it more environmentally friendly. All RAV4 models are further enhanced with Vehicle Stability Control and Traction Control to deliver driving confidence and comfort, while V6-equipped models are fitted with Hill Start Assist Control and Downhill Assist Control, helping the RAV4 deliver big-time SUV capabilities in a smaller, urban-savvy package. All 2009 Toyota RAV4 models enjoy ample stopping power, thanks to power assisted brakes – ventilated discs up front and solid discs on the rear – enhanced by Toyota’s Anitlock Braking System, Brake Assist and Electronic Brake Force Distribution technologies. All 2009 Toyota RAV4 models ride on all-season tires and carry a full-size spare tire to ensure that wherever the road takes Canadians, the RAV4 can get them back again. Inside, the 2009 Toyota RAV4 easily converts from a friend-friendly road reveller to a capable and versatile cargo carrier. Fold-flat rear seats open up more than 70 cubic feet of storage space – almost as much room as one finds in a mid-size SUV – and converting from people to stuff is as easy as flicking a lever. With the RAV4, Canadian drivers will enjoy the freedom of a vehicle that adapts to their lifestyle – whether it’s buddies, bikes or boats along for the ride. All models feature plenty of smart storage for everything from sunglasses and maps to sports gear. Cargo area tie-down hooks, door pockets, double glove boxes, cup holders, storage boxes and console boxes… there’s a spot for everything in the RAV4. When one has a fast-paced, active lifestyle, the road to adventure can lead anywhere – and that means innovative safety systems are essential. With its full-size spare tire and side impact beams to Toyota’s state of the art active front headrests that help reduce whiplash injuries, the RAV4 is designed with occupant safety in mind. Standard safety systems include six air bags (dual stage driver and front passenger airbags, front seat mounted side airbags, and roll-sensing front and rear head/side curtain airbags). Three-point lap and shoulder seatbelts are fitted in all passenger positions, and include adjustable “B” pillar shoulder belt anchors, as well as pre-tensioners and force limiters for the front seating positions. Younger occupants are protected with anchor points for child-restraint seats and child protector locks. 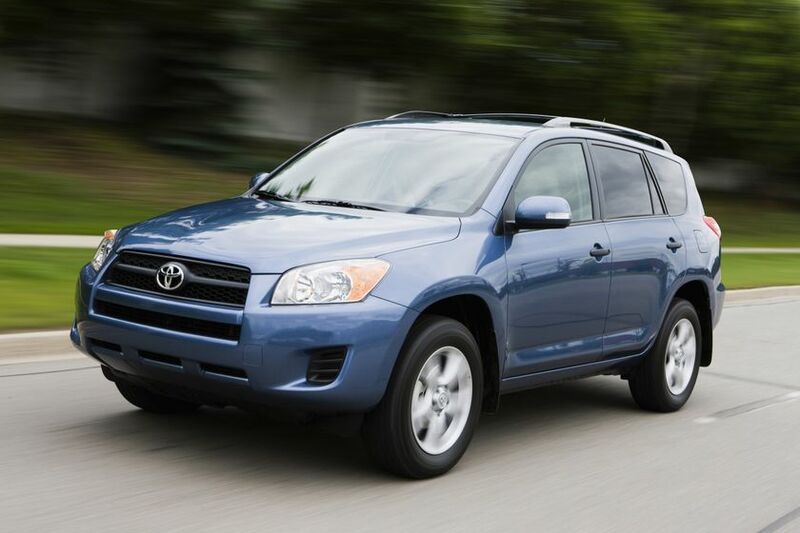 All 2009 RAV4 models are also equipped with an engine immobilizer. Toyota offers a full range of accessories to complement any need. For more information visit the “Accessories” page at http://www.toyota.c/a or see your local Toyota Dealer to view the wide range of available products. The 2009 RAV4 is provided with Toyota's no deductible, no transfer fee, comprehensive warranty that covers the entire vehicle for three years/60,000 kilometres. Powertrain components are covered for five years/100,000 kilometres, major emission control components are covered for eight years/130,000 kilometres and corrosion perforation for five years with unlimited distance. All RAV4 models feature plenty of standard features to create a compact SUV that delivers tremendous value as well as fun and functionality. These include: a fuel-economy meter (new for 2009); high visibility Optitron electronic gauges; tilting + telescoping steering column; cruise control; power door locks with keyless entry; power windows with driver’s side auto up/down function; dual vanity mirrors; illuminated entry and ignition key; cargo area and map lamps; 60/40 split 2nd row seating that can also be operated via a convenient release in the cargo area; plenty of in-cabin storage including a large capacity storage box under the rear deck, front centre console box, upper and lower glove box, front seat back pockets, overhead sunglass storage, front and rear cup-holders, cargo-area tie-down rings, door map pockets and coat hooks; halogen headlamps with automatic headlamp cancel function; power remote heated mirrors with integrated signal lamps; variable intermittent wipers including a rear-window intermittent wiper/washer; and more. Those who are focused on performance, flexibility and efficiency will still find plenty of comfort and convenience features in the 2009 RAV4. From a six-speaker audio system with AM/FM, MP3/WMA-capable CD player and an audio auxiliary input jack… to air conditioning with rear seat heater ducts… to an adjustable cushion height on the driver’s seat, the RAV4 includes many features with your comfort in mind. And it’s all wrapped in an urban-savvy exterior featuring a colour-keyed moulded spare tire cover, front and rear splash guards, and a snappy-looking rear spoiler. Four-wheel-drive models even feature roof rails and crossbars. Get sporty with RAV4 models that come with an extra sense of adventure. Sport models pack all the comfort and convenience of base models, plus fun and functional touches such as: fog lamps; an auto-dimming rear-view mirror with integrated, standalone back-up camera; premium cloth seat coverings; rear privacy glass; eye-catching 18” aluminum alloy wheels with wheel locks; fender flares; a power moon roof; roof rails and crossbars; an automatic headlamp system featuring halogen headlamps housed in a unique black headlamp surround; and more. Add a touch of sophistication to your fun and flexible RAV4, with Limited packages that put your comfort and convenience front and centre. Many of the features found on Sport models are also found here, such as the stand-alone back-up camera. But Toyota gives you a little extra too, with features such as: an upgraded audio system with in-dash six-disc CD changer, steering wheel mounted audio controls and factory-installed XM Satellite Radio; Eight-way power-adjustable driver’s seat; a handy multi-purpose cargo net and tonneau cover; a leather-wrapped steering wheel and shift knob; the Toyota Smart Key system with Push Button Start; and unique exterior accents, from a specially-designed grille to Limited badging. Includes: 17” aluminum alloy wheels; wheel locks; In-dash six-disc CD changer; Factory-installed XM Satellite radio; Rear privacy glass. Includes: Leather seat surfaces; Eight-way power adjustable driver’s seat; Heated driver and front passenger seats; Simulated leather door trim. Includes: Leather seat surfaces; Eight-way power adjustable driver’s seat; Heated driver and front passenger seats; Simulated leather door trim; Voice activated DVD-based navigation system; Steering wheel-mounted audio controls. Includes: Leather seat surfaces; Heated driver and front passenger seats; Simulated leather door trim. Includes: Leather seat surfaces; Heated driver and front passenger seats; Simulated leather door trim; JBL audio system with Bluetooth capability and nine speakers. Includes: 17” aluminum 5-spoke alloy wheels; Wheel locks; 50/50 split and stow third-row bench seat with recline; Rear seat headrests; Third row seat under-floor storage. Features: New engine for this model. Aluminum alloy block; Dual Variable Valve Timing with intelligence; Sequential multi-port electronic fuel injection; Acoustic control induction system; heavy duty battery, starter, alternator and heater; stainless steel exhaust. Features: Overdrive; Gate-type shifter; Transmission cooler. Fuel efficiency (2WD models): 9.4L/100km city; 6.9L/100km highway. Fuel efficiency (4WD models): 9.7L/100km city; 7.2L/100km highway. Features: Aluminum alloy block; Dual Variable Valve Timing with intelligence; Sequential multi-port electronic fuel injection; Acoustic control induction system; heavy duty battery, starter, alternator and heater; stainless steel exhaust. Fuel efficiency (2WD models): 10.7L/100km city; 7.4L/100km highway. Fuel efficiency (4WD models): 11.1L/100km city; 7.7L/100km highway. Dual VVT-i is a Toyota engine management system that independently varies the intake and exhaust valve timing on a continual basis to deliver optimal valve timing for a full range of driving conditions. It improves drivability, performance and fuel efficiency, and reduces emissions. Toyota’s Hill Start Assist Control (HAC) system works to minimize back-rolling when stopped on an uphill grade. Active Torque Control 4-Wheel Drive System switches effortlessly between front-wheel and 4-wheel drive in response to driving conditions, enhancing stability and maximizing fuel economy. A manual 4-wheel lock switch ensures all-road capability no matter how wet or icy the conditions. Neck injuries are the most common reported injury in an accident. Toyota’s Active Front Headrest technology is designed to reduce the stress on the neck during low-speed rear accidents. When a person’s lower back presses into the seatback, the headrest moves forward and up to catch the back of the head, thereby helping to reduce the incidence and severity of whiplash.